Have I mentioned that I’m stubborn? If I’m having problems getting something done right, I can chew that thing like a dog with a bone. I just hate giving up. 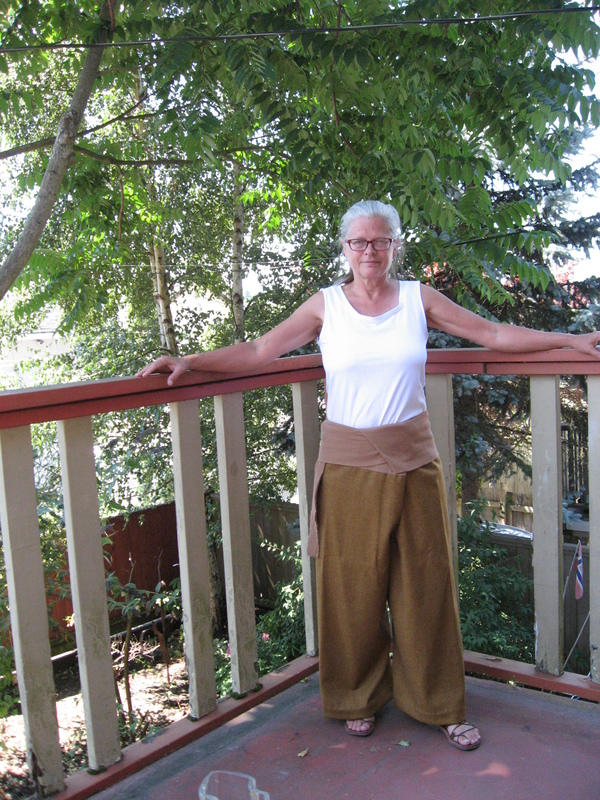 So, I’ve actually been wearing this wool Thai fisher pant, loving the drape and the fabric and wrapping of it around the lower torso, but also knowing it wasn’t quite right. After posting about it and another wool version a few weeks ago, I decided to “revise” it yet again. I ripped out the cotton interlining, to release the actual drape of the loosely woven wool. I examined the centre back/crotch seam and saw that it was very much like that in any pair of pants, but with less curve. I decided to add the kind of curve I need, which allowed me to take the seam in two inches, from the top down to the crotch. I also made more curve in the upper inseams, eliminating an inch or so from each at the top few inches. I then had a brainstorm. I said in my last post on this that the upper rectangle needs to be made of a fabric with a certain amount of stretch, and I found crinkle cotton worked well. It does, but it’s a pretty cheap and unattractive looking fabric. The brainstorm was that I realized this fabric itself has plenty of give, and I had a strip of it left that was plenty big enough. I’m really pleased with the results of these changes. I could post a dozen photos of these with different jackets and vests. Practically everything goes with soft, light grey. 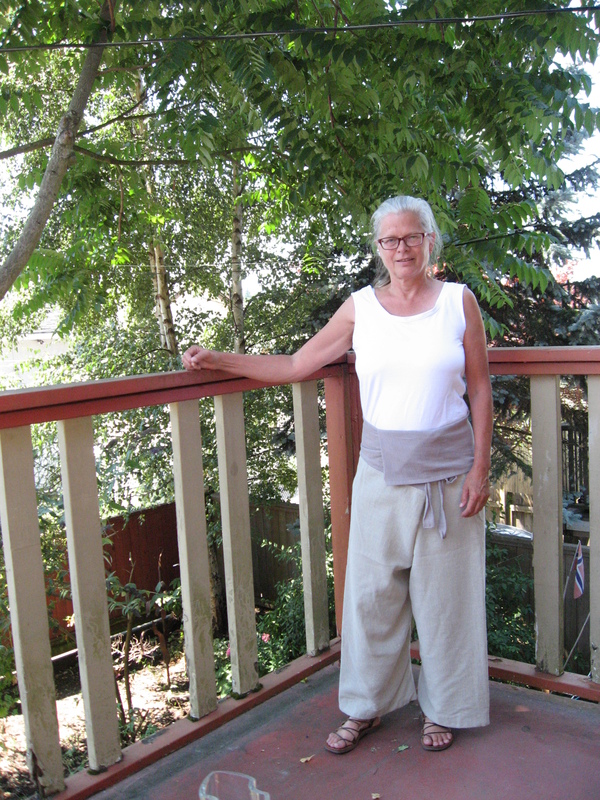 I now think these pants can be made in any kind of drapey wool — probably a wool crepe would be delicious. I want to say the reason I that wanted to try duplicating Thai fisher pants in the first place. It’s because in my “advanced” age, my waist expands and contracts several times in any given day, and my weight tends to fluctuate as well. 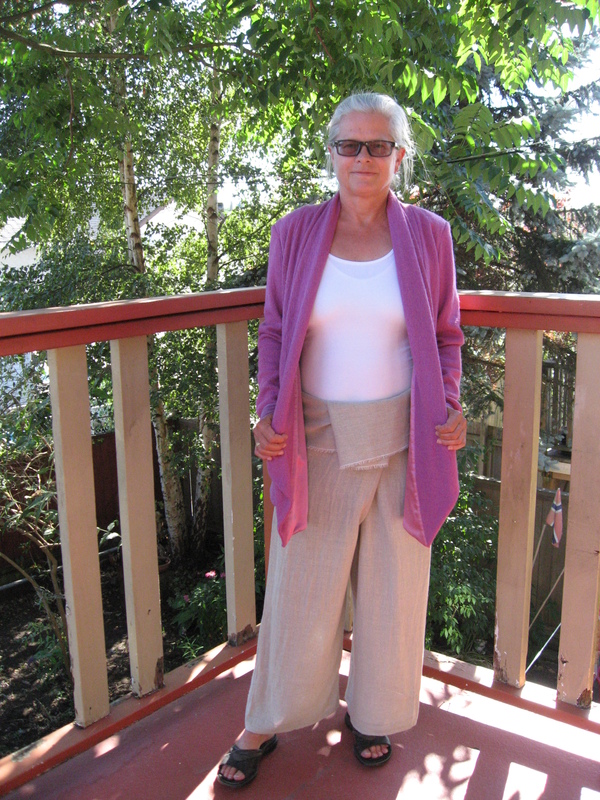 These pants allow for such changes because they don’t have a set closure. I’m not sure yet what I’ll do with the other pair I posted about earlier. But I will be looking for fabric for another pair of these. What do you think? Better? Okay, so last summer I purchased about two yards of a printed cotton fabric. partly because I found it breathtakingly hideous. You know how people can be attracted to horror, even though they know it will give them nightmares? They don’t want to see fatal car crashes, but nevertheless throng around them? It was like that. 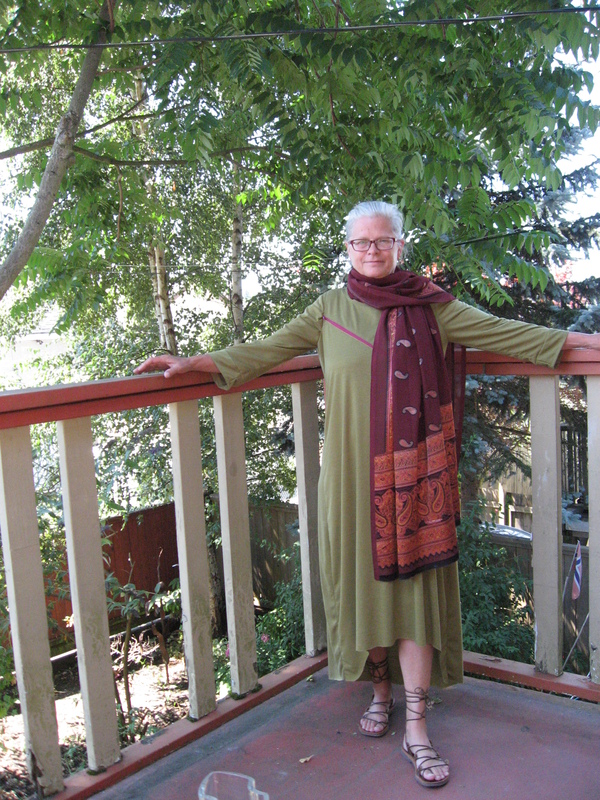 I didn’t know what to do with it other than fold it into a large triangle and wear it as a shawl, which I did a few times because it proved to be quite warm enough for chilly wet-coast rainforest evenings. One afternoon I wore it with an outfit of green leggings and gold tshirt to the dentist. All along the half-hour walk to the dental office people kept saying strange things to me. Things I couldn’t understand. I can’t duplicate them because they might as well have been in a foreign language. Even the dentist’s receptionist said something totally incomprehensible to me. When I got home a friend explained it to me. World Cup. Men’s soccer. Brazil. 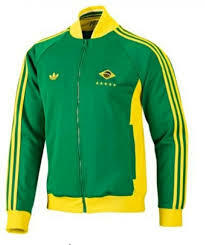 You got it — I was wearing the national colours of one of the finalists while the finals, is that what they’re called (? ), were on. People thought I was rooting for the Brazilian men. As if. 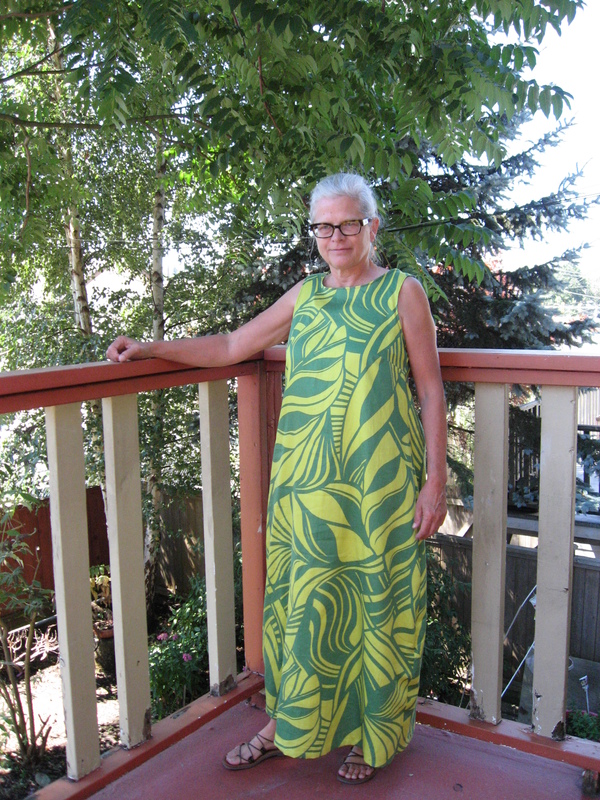 Anyway, I’ve just finished making a floaty maxi summer dress out of the fabric, and I don’t think it’s hideous anymore. Amazingly, it seems to have found its home on the frame of a simple shift. This top/tunic/dress is fairly fitted from the bust up, but then gentle flares out. Because I was working with a limited fabric width, I had to stop the flare and draw a line straight down the bottom third. The effect is of an upside down tulip, or wine goblet. I think that prevents heaviness at the bottom. This dress floats in a breeze. I am going to brazenly suggest that this is a particularly sophisticated dress, because of the shape, and because the fabric is a total match for the pattern. It’s a total fluke of course. This is a pair of Thai fisher pants I bought a few years ago. The fabric was beautiful when I bought them, but I knew a few washings would put a stop to that. I bought them specifically to copy them. In wool. Not exactly what Thai fisher people would want, but hey I live in a colder climate and I don’t fish. I wore this pair a lot; they were a regular part of my work wardrobe for a couple of years. 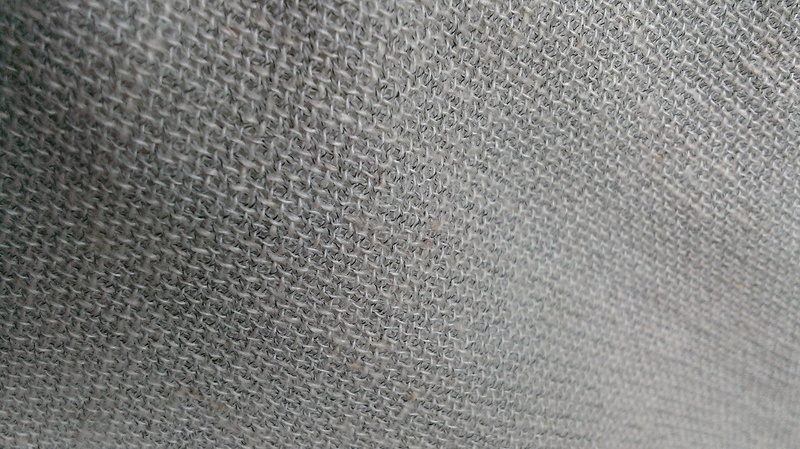 The fabric is a fairly loose weave and because of that, I interlined them in a very lightweight unbleached cotton. The fabric sags at the bottom of one of the legs. I think that’s because of the weave. I’m not happy about that, and I’ve been thinking of recycling the fabric for something else. This pair is a problem. I love them. But I think I’m demented. I love the way these pants fold across the crotch. And though this is a heavy British woolen, the fabric is really, really soft. But there’s a problem with them, isn’t there? 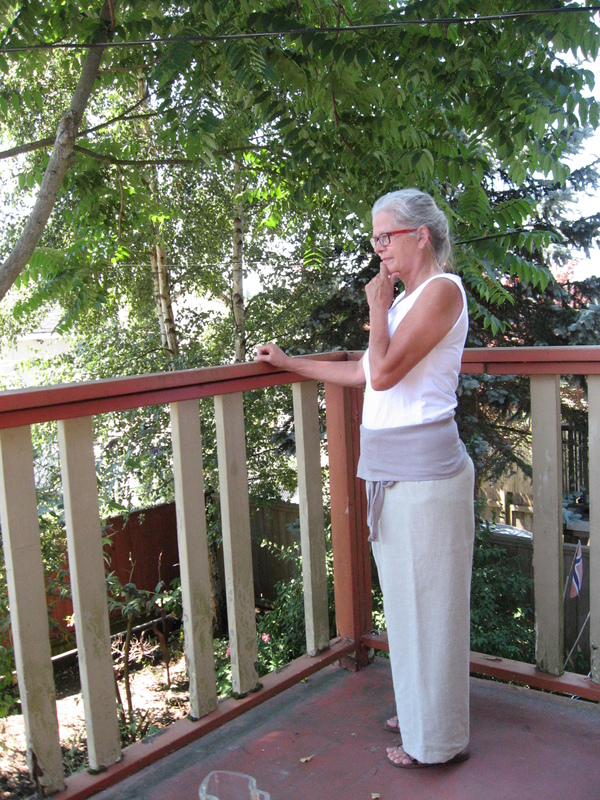 A couple of weeks ago I read a post in Fabrickated in which Kate discussed her own experiments with Thai fisher pants. At the end of the post she commented that she might try a slimmer version. Duh! I’ve been treating my pattern as though there’s no choice for resizing, despite the fact that the pair I purchased were a unisex size large. Of course I can make them smaller!! They’re too big — that’s the problem, isn’t it? Okay, that’s going to be a fall project. I really, really want to make these pants more wearable. 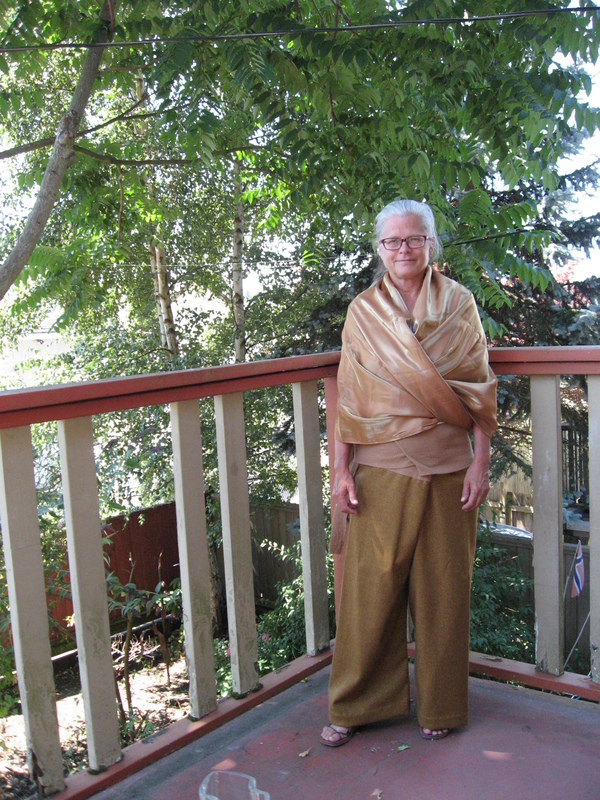 I bought that fabric (wrapped around my shoulders) with a view to making a fitted jacket to wear with the pants. Currently I have nothing to wear with them. So that’s two problems. And there’s yet a third. I have discovered through trial and error that the fabric of the top part, the rectangle that wraps tightly around the lower torso, has to be a stretchable woven. I discovered that crinkle gauze works well. However, I think the gauze just doesn’t match the beautiful wool in terms of quality. It should probably be something like silk crepe on the bias, or maybe a wool gauze, also on the bias. What do you think? Is it possible for all these problems to be overcome? Or should I just give it up and try to reuse the fabric? I started this blog about a year ago, and my first post was about tops I made from a self-drafted flared pattern with a high to low hem. I’ve returned to the same pattern. I love this pattern. It’s so simple and so adaptable. 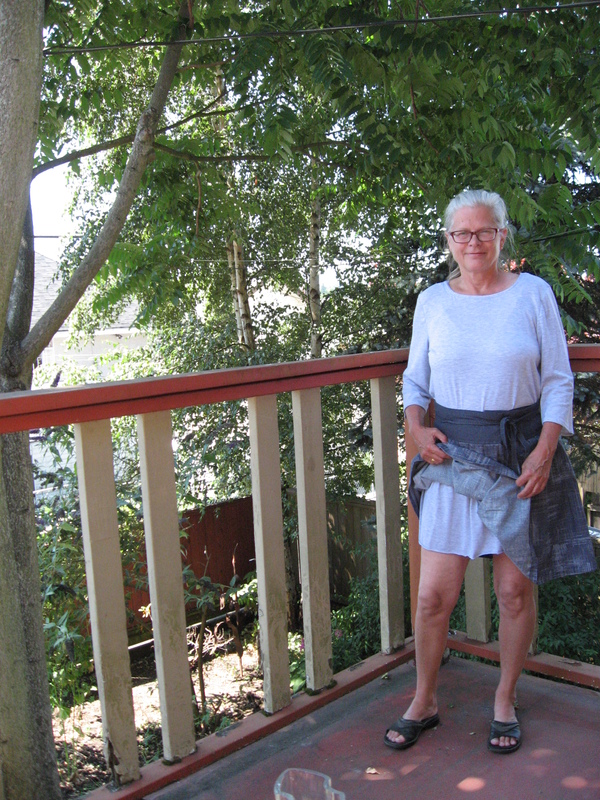 One reason I made this top this “medium” length is because that way it can function both as a top and as an underskirt. This is my Olivia Wrap, which could really use an underskirt, or something, as light does shine through. 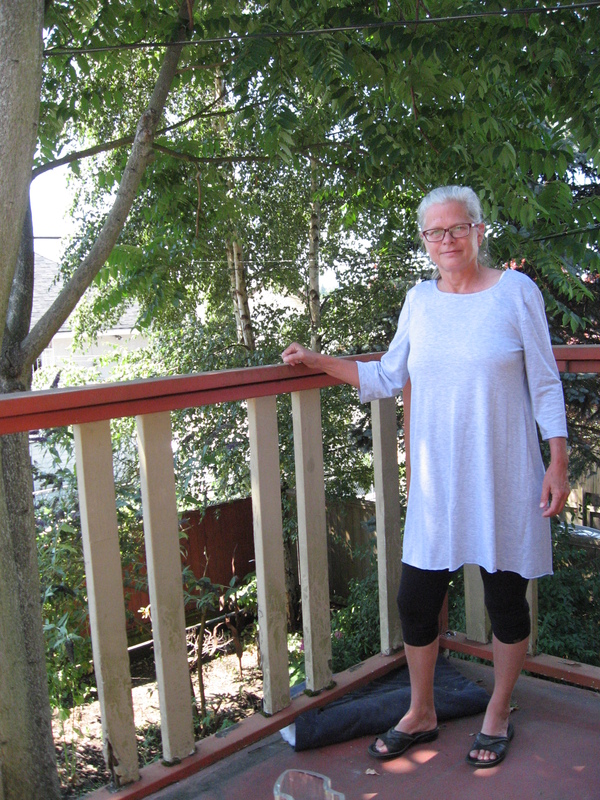 The fabric is a really soft bamboo jersey. I hope it holds up and doesn’t pill right away. I think it was comments by Kate of Fabrickated that I should wear more soft greys that impelled me to actually slap money down for this at this particular time. When I finished that one, I pulled out some other fabric that I bought recently as a roll end, at a drastic reduction. 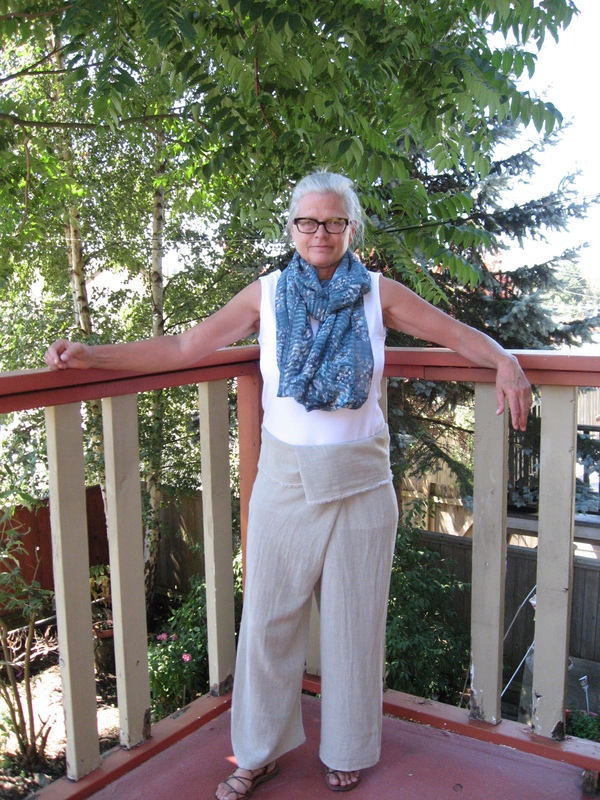 It’s a merino wool that very few stores in town sell, but that I’ve been drooling over ever since I discovered it last year (and made a short sleeveless version of this pattern with). 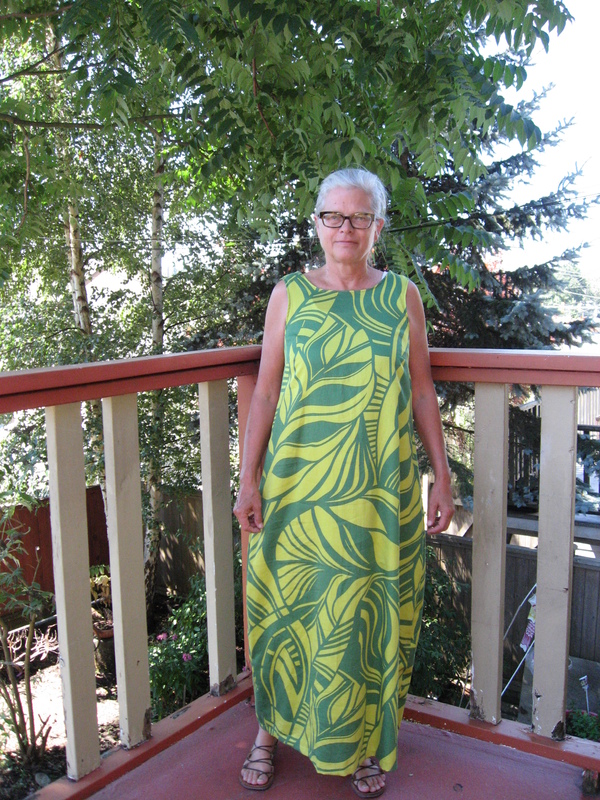 This fabric was so wide that I could make the front and back panels side by side, and have a more or less maxi length shift with 3/4 sleeves. I got the idea for the diagonal zipper after reading a post by Lori from Frivolous at Last, in which she showed some new patterns she bought. One of them had a diagonal zip, and I thought it looked fabulous. I think this magenta zip totally brightens the pea-green of the fabric. I think it’s pea green? Is it pea green? In some light it looks more golden-khakiish. Anyway I love the colour, as I tend to love colours that sort of slant away from the primaries. I spent a few days mulling over how to cut the fabric and install the zipper. I knew if I just slashed the fabric on the diagonal, it could stretch way out of shape and I’d never get it back together. I’ve read some bloggers who have talked about using fusible non-stretch interfacing on stretch knit closures, so I thought I would try that, but I didn’t know where the interfacing should go — on the part that folds under, on the part that doesn’t fold under, or on both? After some experimentation I decided to put it on the part that folded under, so I cut a one inch wide strip and placed it where I wanted it. But I was really hesitant to fuse it to the fabric, you know? So I dawdled and sewed two parallel lines down the middle. I figured I would cut between those two parallel lines. Then, when I had confirmed and reconfirmed about a million times that this was the right placement for the zip, and that it would start at exactly the right place by the sleeve, and end at exactly the right place by the hip, I ironed on the interfacing, cut the fabric plus interfacing between the two lines of stitching, folded top and bottom pieces half an inch and pinned on the zip. Then I knew I had a problem. The zip, of course, is totally inflexible. The jersey, when pinned to it, looked a little bit rippely, or wavey, as if there was too much fabric for the length of the zip. I knew it would have to be eased in while sewing. I pulled out my walking foot. But the walking foot isn’t designed for zippers, so I had to experiment,again, with a spare zipper, to see if it would march right along on top of the zipper teeth. And it did! That walking foot as a tank, man. It’ll march over anything. I’d say this zipper installation is about the closest I could possibly come to perfection. There’s no gap between the top of the zip and the sleeve and the zip lies perfectly. It’s not, by the way, on a straight diagonal. I put in a very slight curve. And it’s fully functional! I’m not entirely sure what to do about the bottom hem. The missing part of the front is where I cut the sleeves. It created a steep low to high curve. Should I keep it, or make it more gradual? At the last moment I decided the sleeves would be too short if I turned them over to hem them, so instead I made facings which I attached to the sleeves, thereby actuallly lengthening the sleeves a bit. Crone robes, yesss. 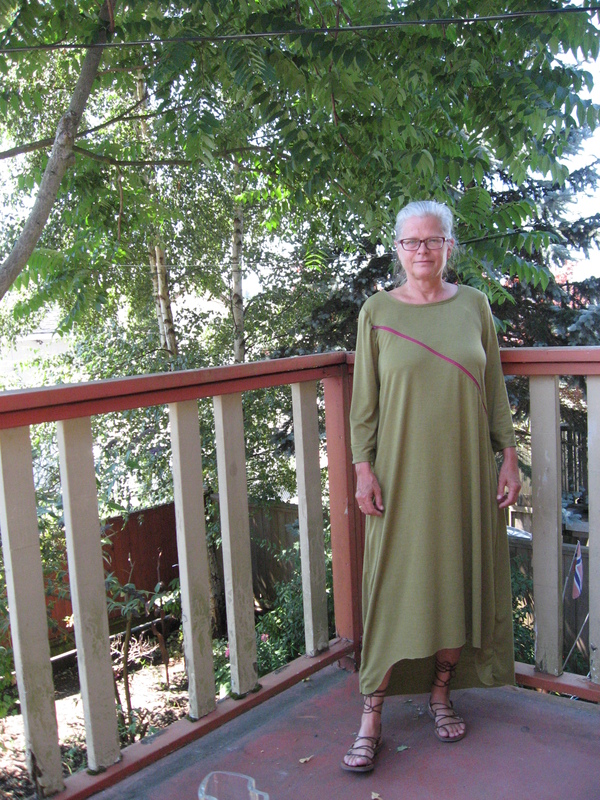 Fashion for the boomer wise-woman! Hmm. Looking a little too much like the good shepherd here. The belt is some kind of leash — for a dog? a horse? A yard-sale find. The sandals are a Salvation Army Thrift Store special. They actually have my name stamped on the leather insole — my name is the brand name of the shoe. Can you believe that? 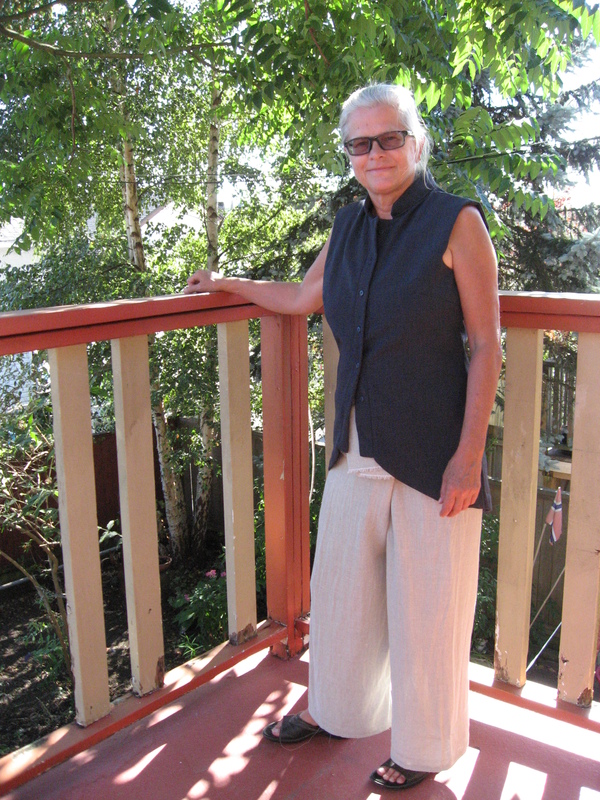 I’ve noticed that among sewing bloggers there are those that love high-low hems and those that don’t. I love them for shorter tops, thigh-length tunics and maxi shifts primarily because they elongate my body. I’m about two inches shorter than I should be 😛 Everyone in my genetic family is taller than I am. And the length I’m missing is from my legs. They’re too short for my torso. So anything that lengthens my legs is good, anything that lengthens all of me is good, and anything that hides where my legs stop and my torso starts is good. Anyway, I know it’s rude to talk money, but I want to say that this little number cost all of $10 CAD. I’m sure it would be way out of my price range in a store. Just one of the joys of sewing.